SANRAL, jointly with the KZN Department of Transport, is upgrading the existing N2/M41 Mt Edgecombe Interchange north of Durban to a systems interchange that will provide free-flow movements in all directions. Due to the expansion of the uMhlanga, La Lucia Ridge and anticipated Cornubia areas, this interchange is currently operating at capacity with vehicles backing up on the M41 and onto the N2 in peak hours and motorists experiencing severe delays. 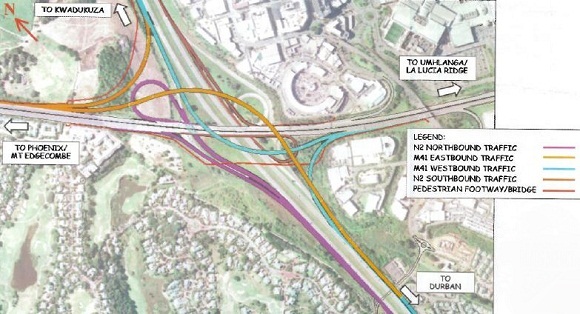 Therefore, the existing interchange requires a major upgrade in order to improve the flow to and from the N2 and M41 to the supporting road network. The proposed interchange facility will provide at least two lanes on each of the major movements as described below and shown on the layout. Motorists travelling along the N2 northbound (from the south) and travelling towards uMhlanga and Gateway will take the offramp as they do now, but instead of stopping at a signalised intersection as they currently do, will be taken under the M41 and then loop around back onto the M41 and merge with the eastbound traffic on the M41. A new bridge will be constructed under the M41 to facilitate this movement. A temporary diversion of the M41 will be constructed to facilitate the construction of the bridge under the M41. Motorists travelling along the N2 northbound (from the south) and travelling towards Mt Edgecombe and Phoenix, will take the off ramp as they do now onto a slightly re-aligned ramp. Motorists travelling from Mt Edgecombe and phoenix (from the west) and travelling onto the N2 southbound towards Durban will take a new ramp over the N2 and the M41 before merging with the N2. This approximately 26m high ramp will comprise of a 947m long viaduct, that will be constructed using the Incremental Launch (IL) method. It will be the longest constructed by the IL method in South Africa, once completed. Motorists travelling from Mt Edgecombe and Phoenix (from the west) and travelling onto the N2 northbound towards the Airport and the Northcoast will take a new ramp constructed for this movement. Motorists travelling from uMhlanga and La Lucia (from the east) and travelling onto the N2 northbound towards the Airport and the Northcoast will take a new ramp over the N2 and the M41 before merging with the N2. This ramp will be comprised of a 443m long viaduct, approximately 18m high that will be constructed using the Incremental Launch (IL) method. Motorists travelling from uMhlanga and La Lucia (from the east) and travelling onto the N2 southbound towards Durban and the Southcoast will take a new ramp constructed for this movement. Motorists travelling along the N2 southbound (from the north) and travelling towards Mt Edgecombe and Phoenix will take the off ramp as they do now, but instead of stopping at a signalised intersection as they currently do, will be taken under the M41 and the loop around back onto the M41 and merge with the westbound traffic on the M41. The existing bridge over the N2 will be widened on the southern side to facilitate this movement. Motorists travelling along the N2 southbound (from the north) and travelling towards uMhlanga and La Lucia will take the off ramp as the do now and onto a re-aligned ramp before merging with the M41 eastbound traffic. The M41 will be widenened in both directions with a median barrier wall separating the two carriageways from the east of the N2 at the Umhlanga Rocks Drive interchange to approximately 500m west of the N2. Widening of the existing Armstrong Loop ramp to two lanes onto the M41 westbound carriageway. Formalised footways with a new pedestrian bridge over the N2 to the south of the existing bridge over the N2. Streetlighting on all the ramps. Retaining walls within the interchange to accommodate level differences between the ramps and adjacent roadways. Construction commenced in May 2013 and will last approximately 3 years.